Unifies and Standardizes High-impact engagement with customer through all Electronic Channels & Customer View of Data. Provides a single point of Integration between all channels, Core Systems and services. 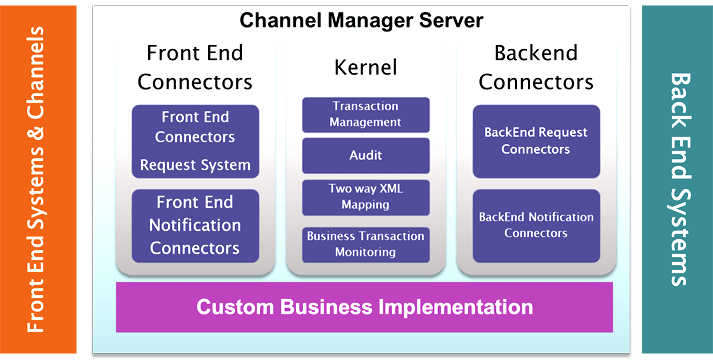 Reduce Integration cost Substantially and Reuse Integration Path to drastically reduce time-to- Market for Channel Implementations. Easily Enforce Business Limits on Channels. Flexible solution that adapts to your Business Dynamics. Manage all channels from a single point. Reduce costs related to licencing and operations. Brings together business functionality and management of all channels into a single place. Allows the enterprise to freely deploy new products and services, QUICKLY!. Web, Mobile, SMS, Smart Phone , Voice (IVR, Call Center), CRM and others.